if it’s not equipped with a good, sharp blade. to first understand their anatomy. © Copyright Trees 2 Money 2011. All rights reserved. Band sawmill blades are set “raker style” – in other words, one blade is set (bent) left, one set (bent) right and the third is the raker blade and is straight up. There is a lot to consider when choosing blades. It’s a science and art all on its own. This explains why there are such huge differences in pricing – you can get cheap blades and you can get expensive blades and everything in between. You need to know the difference so you have a better chance to find which blades are best for you. Premium, Average or Poor? – Not all blades are created equal – some are premium, some are average and some are poor. You’ll want to consider two things – the material used and the technology used to harden the teeth. Blade Material – The type of steel used to make the blade is CRITICAL. Virtually all band blades for wood are made of common carbon-alloy steel. A few premium blades are made of silicon-alloy steel (silicon-steel). The advantage to silicon-steel is that it tends to be much stronger and more durable. The advantage to common carbon-steel blades is that they cost less. Of course, you need to balance cheaper purchase price against a shorter life expectancy and possibly poorer results. Teeth Hardening – The blade teeth MUST be hardened otherwise they can lose their sharpness in a single cut. Many sawmill blade manufacturers still use traditional less-sophisticated hardening which can be uneven. A few blade manufacturers have started induction-hardening their blade teeth which provides a more consistent, harder tooth. 1 ¼” or 1 ½’ wide? 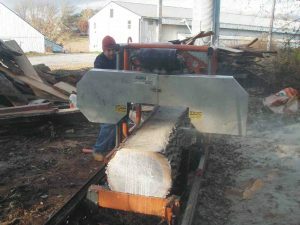 – Most band blades for portable sawmills are 1 ¼” wide, an all-purpose size. Only a rare few sawmills accept both the standard 1 ¼” as well as wider 1 ½” blades. 1 ¼” is the standard blade width suitable for most milling. If you want to mill large hardwoods commercially, you may want to move up to a 1 ½” blade. The drawback is that 1 ½” blades cost more. Blade Pitch – A blade’s pitch is the distance from the tip of one tooth to the tip of the next. Standard blades are 7/8″ pitch – this pitch is ideal for all-purpose milling of most hardwoods and softwoods. Decreasing the pitch to ¾” or less is sometimes helpful for milling harder density logs (frozen logs or some hardwoods). Increasing the pitch to 1″ can sometimes speed up milling very soft logs. Tooth Set – Band sawmills run raker-style blades – that is, one tooth is set left, one is set right and the third is straight up (raker tooth). The set is the distance that the teeth are offset from straight. If all the teeth were straight (no set), the blade would not be able to cut. The ideal amount of set depends on what you’re milling – generally speaking, less set the harder the wood.